Graphic Novel Review 19/365: Space Battle Lunchtime – Oni Press Week! Please read past Graphic Novel Reviews of my 365 in 365 here. Welcome to day six of Oni Press Week! This week I’ll be featuring reviews of a bunch of cool titles from the good folks over at Oni Press. I like space, and I like cooking shows, so this book is right up my alley! 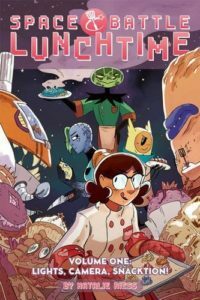 Basic premise: Peony is a kind-hearted baker that gets beamed up into space to be part of a cut-throat cooking challenge show called Space Battle Lunchtime. Pitted against some of the best cooks int he galaxy, Peony must hold her own, navigate a strange landscape, and learn/teach a few lessons in the process. This book is extremely fun! The page layouts are unique, the colors bold, and the characters are enjoyable. As a serious fan of cooking shows, I got a lot of the satire in the book, and this is one of the reasons I gave this book a 10+ rating: I think a lot of the jokes play to a slightly older audience. It does read as a book for kids, but reading this one with your little ones might open up discussions about food and competition and fairness, so I suggest you do just that! Maybe even a cooking challenge at the house among siblings?? In that way, this book is different than any of the other books I’ve reviewed…it’s about food. You know I read a lot of different comics, and this isn’t even the first one I’ve read about a reality television cooking show, but it’s refreshing to see authors, writers, and publishers trying something new! Check this one out and have fun!